Snapdragons (Antirrhinum majus) are colorful cool season bedding plants. Their tall flower spikes come in almost every color of the rainbow, make excellent cut flowers, and are rarely bothered by pests and disease - three attributes that make them one of the most popular flowers to grow. Snapdragons are technically considered tender perennials, but they are almost exclusively grown as annuals. They can take temperatures down to about 20 degrees, but even if they survive for more than one year, they tend to limp along and do not continue to put out impressive flower displays. Snapdragons range from six inches to three feet in height depending on the variety, but cultivars in the 12 to 18 inch range are most commonly seen. The flowers are borne on tall, narrow spikes above the foliage and open from the base of the plant up as it grows. There are varieties in pastel tones and others in bold, saturated colors. 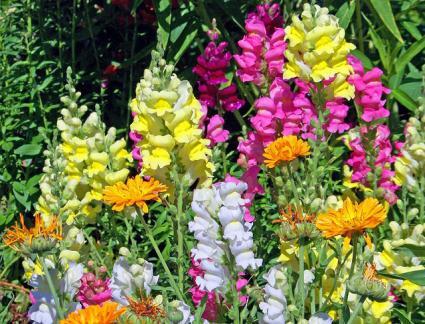 Many snapdragon varieties bear multi-colored flowers. The name originates from their unusual flower structure - when squeezed on the sides, the upper and lower petals open like a pair of pursed lips. Annual flower beds are the primary use of snapdragons, but the larger varieties are also useful as seasonal filler in perennial borders. The tiniest varieties can be used in rock gardens and window boxes. Planting time for snapdragons varies based on the climate where you live. In cold climates (USDA zones 7 and below), plant them out in spring several weeks before the last frost. They will bloom for several months before petering out in the heat of summer, but can be planted again in late summer for a fall bloom. In warmer regions (USDA zones 8 and up), plant them in mid-autumn. They will grow through the winter and start flowering in early spring. Snapdragons are easily grown from nursery transplants or from seed. Plant seed directly where it is to grow and cover it with just a light sprinkling of soil as it is very small. 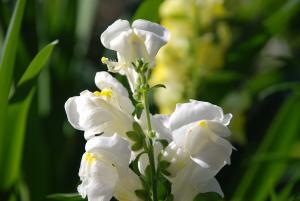 Snapdragons need full sun and rich, well-drained soil. Amend the planting area with several inches of compost and form the soil into a low, broad mound. 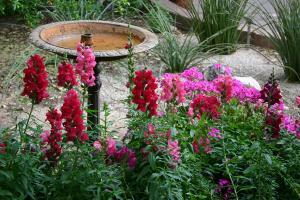 Snapdragons appreciate ample moisture, so make sure to water them whenever the top inch of soil becomes dry. Feeding them every few weeks with an all-purpose fertilizer will promote abundant flowering. The tallest varieties may need staking to keep them from toppling over in the wind. After the first round of flowers fades, cut the stalks back to a few inches below the point where the flowers started and they will send out another round of blossoms - as long as temperatures remain in the optimal range. One of the most wonderful things about snapdragons is that they are not bothered by pests or disease. 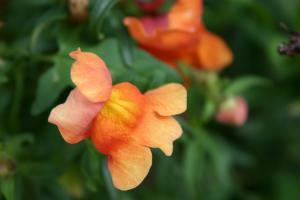 Snapdragons are one of the most popular bedding plants in garden centers. There are hundreds of named varieties, but they are most often found in mixes. All are hardy in USDA zone 8 to 11, typically grown as annuals. 'Floral Showers' is a dwarf mix eight inches tall with 12 different colors, including a number of bi-colored varieties. 'Rocket Series' grows to three feet tall and includes various bold shades of pink, red, white, purple, and yellow - it is one of the best for cut flowers. 'Twinny' is a mix of pastel colored varieties growing about one foot tall, including soft shades of peach, cream, salmon, and pink blush. 'French Vanilla' is a pure white variety with a tinge of yellow between the 'lips' of the petals, growing about two feet tall. Snapdragons are a great way to add instant color to the garden. They are incredibly common, yet their appearance is so unique that they never seem to lose their appeal.